He feels a little overwhelmed by all of your excitement to read his innermost thoughts (well only some of you expressed excitement). Also fyi, he is not the best writer, so I will probably have to proof his guest post anyway. However, he IS excited to let you in on his inner most secrets about being married to the most wonderful, beautiful, coolest, self-sacrificing, chore doing, best listner, patient and most amazing wifey that anyone could ever ask for EVER. He might even tell you the secret to finding someone as amazing as me. Or he might just tell you once you find that amazing someone….take them to Vegas, get them drunk, and marry them. Well ok, maybe it didn’t happen EXACTLY like that….but I guess we will have to wait to see what he has to say. Until then, I will hold my (bated) breath in anticipation with the rest of you. I guess you will just have to keep checking in to see when he feels the need to inpart his words of wisdom to the masses. After all, he did go to Yale– however, I pretty much wrote his thesis…. Upon checking the mail this week, Hubby received a letter from Yale University, where he had previously gone to graduate school. Let me remind you, that he has not even been out of school for a year yet, and just 3 months ago he was receiving “Would you like to make a donation” letters. Ummm, let me think about that. Heck no! I mean we are still getting over the fact that we don’t have to eat PB&J sandwiches everyday! So, when I saw this envelope, I thought it was more of the same thing. I left it on the counter for Hubby to read. Hubby opens it later and laughs out loud. 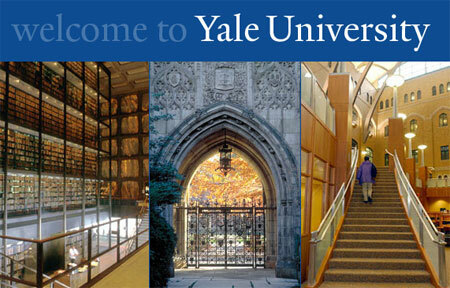 Hubby: I think I will be making a call to the Yale Accounts office in the morning. Hubby: Look at this letter! Hubby: This is my bill for the Fall 2008 semester……they think I am still there….but I GRADUATED! Me: HILARIOUS….They must have sent it because you wouldn’t donate! Gotta make money somehow! It’s rough times…. even for the Ivy Leagues! So, over the weekend we got a letter asking us to donate to Yale University (mind you, hubby has approximately been out of grad school…maybe 6 months now—but who is counting?). It made me laugh out loud when I saw it! I mean, mind you I would LOVE to have gobs of money to donate to different things, but since we have yet to embark on the road of the rich and famous…this letter came as a surprise. I mean we sweated, starved, and ate a lot of PB&J and what did they say to us: live cheaper and you shouldn’t have pets….i.e. never mind the fact that CT is one of the MOST expensive places to live. Right, please let me donate to you, Yale, meanwhile we only have $2.01 in our joint account after paying all the bills this month. So, what did I do? I showed the letter to hubby. He laughed out loud too! He suggested we send it back and write in Sharpie…”I will donate to you…..if you pay my tuition bill.” I am thinking of trying that….but I don’t think it will do any good….perhaps we should show them a picture of the money and a picture of the tuition bill, kinda like you pay this, then you get this…. Oh well, just the same it did give us both a good laugh and at least they gave us about 6 months before they started asking/begging….I guess that is enough time to get re-established in the real world…..right? I mean sure maybe in a perfect, rich world….maybe I will just send Charlotte up there to bite them…..